هدف این مقاله، مطالعه تجربه زیسته کاربران ایرانی اینستاگرام است. ویژگی‌های خاص این شبکه اجتماعی سبب شده است تا نوع خاصی از تعاملات به‌واسطه آن شکل بگیرد. این ویژگی‌ها تجربیات نوینی را در روال‌های هر روزه کاربرانِ فعّال جایگیر کرده است. بنابراین، محققان بر کاربرانی متمرکز شدند که تجربه حضور کافی در اینستاگرام را داشتند. در این مقاله، برای فهم معنای عمیق این تجربیات از رویکرد پدیدارشناسی تفسیری و روش مصاحبه نیمه ساخت‌یافته استفاده شده است. در مجموع با شانزده نفر مرد و زن مصاحبه شد که مدت میانگین عضویت آنها در اینستاگرام دو سال بوده است. در نهایت، بر اساس تحلیل مصاحبه‌ها مضامین مختلفی در رابطه با نقش اینستاگرام در زندگی روزمره کاربران شناسایی شد که مهم‌ترین آنها عبارتند از: لایک به‌منزله تحسین و نیز ایجاد رابطه اجتماعی؛ کامنت به‌منزله میدان گفت‌وگو؛ ارزشمند بودن تعداد زیاد فالوئرها؛ و نیز عدم شکل‌گیری دوستی واقعی در میان فالوئرها. 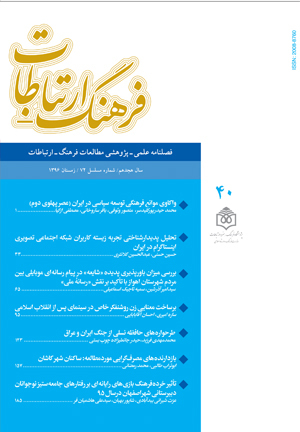 در کل، باید اشاره کرد که تجربیات زندگی در شبکه‌های اجتماعی همانند طرد و پذیرش اجتماعی با توجه به محو شدن فزاینده تمایز زندگی واقعی از زندگی مجازی، از نظر پیامدهایی که برای زندگی واقعی دارد نباید مورد غفلت قرار بگیرد. از سوی دیگر، هر نوع اختلال در کردارهای هر روزه کاربران اینستاگرام، می‌تواند به برخی پیامدهای منفی روان‌شناختی و اجتماعی منجر شود. The objective of the paper is to study lived experience of Iranian Instagram users. The forming of specific kind of interactions has established by special features of the social media. The features embedded new experiences in the everyday routines of the active users; so the authors concentrated who are since long time active in this social media. Interpretive phenomenology approach and semi-structured interview has been used to understanding the deep meanings of their experiences. Concentrating on experienced users with at least two years of membership, totally, sixteen participants have been interviewed. Thematic analysis has been used for analyzing participants’ answers. Analysis of the data identified different themes such as like as appreciation and creation of social relationship; comment as dialogue field; the importance of affluence of users; and lack of formation of real friendships. In sum, regarding increasing blurring of real and cyber life differences, one must not ignore consequences of cyber experiences such as inclusion and exclusion on real life. Furthermore, any interruption in the everyday practices of Instagram users could lead to negative social and psychological consequences. بنت، اندی (1386). فرهنگ و زندگی روزمره، ترجمه لیلا جوافشانی و حسن چاوشیان. تهران: اختران. Biggerstaff, Deborah and Thompson, Andrew R. (2008). Interpretative Phenomenological Analysis (IPA): A Qualitative Methodology of Choice in Healthcare Research. Qualitative Research in Psychology,Vol. 5(3), pp. 214-224. Brocki, Joanna and Wearden, Alison (2006). A critical evaluation of the use ofinterpretative phenomenological analysis (IPA) in health psychology. Psychology and Health, 21 (1). pp. 87-108. Dusek, Val (2006). Philosophy of Technology: An Introduction. Malden & Oxford: Blackwell Publishing. Fuchs, Christian (2014). Social Media: A Critical Introduction. Los Angeles and London: Sage. Golbeck, Jennifer (2015). Introduction to Social Media Investigation, A Hands-on Approach. Amsterdam & Boston: Elsevier. Humphreys, Lee (2013). Mobile Social Media: Future Challenges and Opportunities. Mobile Media & Communication: 1(1): 20-25. Langdridge, Darren (2007). Phenomenological Psychology: Theory, Research and Method. Harlow: The Open University. Pietkiewicz, Igor & Smith, Jonathan A. (2012). A practical guide to using nterpretative Phenomenological Analysis in qualitative research psychology. Psychological Journal, 18(2), 361-369. Rasmussen, Terje (2014). Personal Media and Everyday Life: A Networked Lifeworld. New York: Palgrave Macmillan. Reiners, Gina M. (2012). Understanding the Differences between Husserl’s (Descriptive) and Heidegger’s (Interpretive) Phenomenological Research. Nursing & Care; Volume 1 : Issue 5. Sheldon, Pavica (2015). Social Media: Principles and Applications. New York & London: Lexington Books. Smith, Jonathan A. and Osborn, Mike (2007). InterpretativePhenomenological Analysis; in Qualitative Psychology: A Practical Guide to Research Methods. London: Sage. Ting, Cheung Ting (2014). A Study of Motives, Usage, Self-presentation and Number of ollowers on Instagram; Discovery – SS Student E-Journal, Vol. 3, 2014, 1-35. Turkle, Sherry (2015). Reclaiming Conversation: The Power of Talk in a Digital Age. London: Penguin Books.